The Aroma Therapy Series collection of incense has a soul healing fragrances in ranges. A boon to the practitioners, each one has a soothing effect that brings back good health. This incense stick is made using high grade combustible materials and aromatic flowers that releases a smoky fragrance which is deeply admired by one and all. Arruda is a special herb that make our incense more effective. 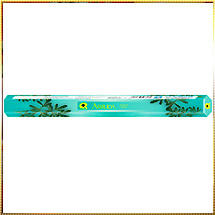 We provide Incense Stick in attractive packaging which grabs the attention of all.